i. RBI in its fifth bi-monthly monetary policy statement kept the policy rates unchanged. ii. On the basis of an assessment of the current and evolving macro-economic situation, the RBI has decided to keep the policy repo rate under the liquidity adjustment facility (LAF) unchanged at 8.0 per cent. iii. It has also kept the cash reserve ratio (CRR) of scheduled banks unchanged at 4.0 per cent of net demand and time liabilities (NDTL). iv. It has said that it will continue to provide liquidity under overnight repos at 0.25 per cent of bank-wise NDTL at the LAF repo rate, and liquidity under 7-day and 14-day term repos of up to 0.75 per cent of NDTL of the banking system through auctions. vi. The headline inflation has been receding steadily, and current readings are below the January 2015 target of 8 per cent as well as the January 2016 target of 6 per cent,'' the RBI said. Note: As on 2, Dec, 2014, RBI (Reserve Bank of India) in its fifith bimonthly monetary policy statement kept the key policy rate unchanged. i. 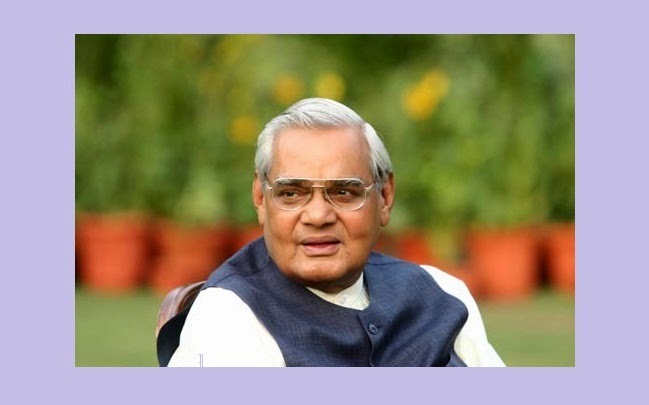 Former Prime Minister Atal Behari Vajpayee's birthday on 25th December would be observed as national 'Good Governance Day', Prime Minister Narendra Modi said on Tuesday. ii. Modi was addressing party MPs at the meeting of the BJP Parliamentary Party, where BJP President Amit Shah was also present. iii. "Prime Minister Narendra Modi told the party MPs that the birthday of former Prime Minister Atal Behari Vajpayee would be observed as national 'Good Governance Day' on December 25, where all BJP MPs and government officials will make the day symbolic of good governance," Minister of State for Parliamentary Affairs Rajiv Pratap Rudy told reporters in New Delhi on Tuesday. i. Senior Congress leader A R Antulay passed away here today after a prolonged illness. He was 85.
ii. Antulay, who was a former Maharashtra Chief Minister and a Minister in the UPA-I government, was suffering from a kidney ailment. He breathed his last at the Breach Candy hospital, where he was admitted last month. iii. The veteran Congressman, who hailed from the coastal Konkan region of Maharashtra, passed away at around 10 am today, his son-in-law Mushtaq Antulay, told PTI. iv. The funeral will take place at his native Ambet village in the State’s Raigad district tomorrow. i. India today successfully test-fired its nuclear-capable strategicballistic missile Agni-IV, with a strike range of about 4,000 km, from a test range off the Odisha coast. ii. This was the fourth trial of Agni-IV missile. The last trial was carried out successfully on January 20 this year from the same test range off Odisha coast. iii. Supported by a mobile launcher, the sleek missile was flight tested from the launch complex-4 of Integrated Test Range (ITR) at Wheeler Island, at about 10.20 am. iv. The test conducted by the specially formed Strategic Force Command (SFC) was successful, Ravi Kumar Gupta, Director of the Directorate of Public Interface, Defence Research and Development Organisation (DRDO), said. i. Film artist of Ireland Duncan Campbell on 1 December 2014 won Turner Prize 2014 for a video called It For Others. The video reflects on African art and includes a dance sequence inspired by Karl Marx. He received the prize of 25000 pounds at Tate Britain in London. ii. He became the fifth winner of Tuner Prize 2014 since 1996 and the fourth graduate of our Master of Fine Art programme from the Glasgow School of Art to have won the prize in the last 10 years. i. Rajdeep Sardesai penned the book titled 2014: The Election That Changed India. The book was released on 1 November 2014.
ii. The book tracks the story of 2014 Indian general elections that changed the political landscape of India and is regarded as the most important elections in Indian history since 1977. The 2014 election led to the demise of grand old party of India Congress Party and spectacular rise of Bharatiya Janata Party (BJP). iii. The book is a thoughtful reflection on what ails India’s sensation-seeking, ratings-addled and chronically shallow news television. About Rajdeep Sardesai : Rajdeep Sardesai is an Indian news presenter and author. Sardesai is currently a consulting editor at the India today group and will be doing a marquee show for Headlines Today. i. The veteran music critic of The Hindu SV Krishnamurthy passed away on 30 November 2014 after a brief illness. He was 89.
ii. Born in 1925, Krishnamurthy joined The Hindu in 1947 in a Kasturiranga Iyengar studentship and was promoted as a sub-editor in 1948.
i. The Prime Minister of Taiwan Jiang Yi-huah on 29 November 2014 resigned after election loss. He lost his first election since protests erupted over a controversial TRADE deal with mainland China. ii. His ruling party Kuomintang party (KMT) was placed second in election with just over 40 percent support. Democratic Progressive Party won the elections with more than 47 percent of the vote. i. Veteran actor-filmmaker Deven Varma, best known for his comic performance in Khatta Meetha and Angoor, passed away this morning at his residence following a heart attack, family sources said. He was 78.
ii. Varma started his acting career as a stage artist and eventually made his Bollywood debut with a supporting role in Yash Chopra’s Dharmputra in 1961, which did not do well. iii. He shot to fame with his performance in 1975 film Chori Mera Kaam, which bagged him his first Filmfare Award for Best Comedian. iv. Varma went on to star in memorable films like Chor Ke Ghar Chor, Sanjeev Kapoor-starrer Angoor, Gol Maal, Khatta Meetha, Naastik, Rang Birangi, Dil, Judaai, Andaz Apna Apna and Dil Toh Pagal Hai. v. His dual role of Bahadur in Gulzar’s 1982 film Angoor, is considered as one of the most loved comic roles in Hindi cinema. i. Russia on 30 November 2014 launched the new generation navigation satellite GLONASS-K from the Plesetsk space centre in Russia’s northwestern Arkhangelsk region. ii. The satellite was launched on a Soyuz-2.1b carrier rocket with a Fregat upper stage. The carrier rocket was launched in a normal mode. iii. This is the fifth launch of a Global Navigation Satellite System satellite (GLONASS) from the Plesetsk space centre. The first launch of a GLONASS satellite from Plesetsk took place on 26 February 2011.
ii. West Zone defeated South Zone by two wickets. Chasing an imposing 315 for victory, West surpassed the target by making 319 for 8 in 47.1 overs. Sent in to bat, South had made 314 for 7 in their 50 overs. iii. Earlier, East Zone registered a 52-run win over North Zone in the first semi-final in Mumbai.